Although the village of Marden is not recorded in the Domesday Book, the Domesday Monachorum of 1085 lists a church standing here, a daughter church of St. Mary’s in Maidstone (now All Saints). This early church was probably of wooden construction in common with other Saxon churches and was later replaced with a more solid stone structure. Today’s building is made up of Kent ragstone, sandstone and a little crowstone. The oldest part of today’s building, the Chancel, dates from around 1200. The entrance to the church building is via a very solid medieval linenfold door with fine ancient benches on either side of the outside Porch. To the left of the door, in the churchyard, stand the old village stocks, which have been moved to their current position for safety. These originally stood in the Village Square. Inside, above the Porch is the Parvise or Parish Room; there is a Newel Staircase leading to this chamber. In this room, the priest would conduct parish business as well as storing the various church documents and vestments. It is thought that relics were also kept here, to be shown to the congregation below. In early days, it is quite possible that this chamber was also used as a place of habitation for the Priest-in-Charge. Meetings were also held here in the past although Vestry notes confirm that these gatherings often adjourned to the more comfortable surroundings of the White Lyon public house! As is tradition, at the entrance to the church stands the font, dated 1662. This was put in place towards the end of the Commonwealth period, in the year in which the Book of Common Prayer was first published. The Jacobean oak cover, made at the same time as the font itself, is unusual as it opens up like a cupboard rather than being lifted off; this is known as a ‘triptych’ cover. The initials that appear on the font are those of Edward Maplesden and Robert Bell, the Churchwardens of the day. The Maplesden family were well-known clothiers and an 18th century monument to the family can be seen placed over the pulpit. It was during the 18th century that the family started a charity, which has been distributed in the village right up to modern times. In the north wall opposite the porch is the door, now sealed up, which, prior to the Restoration, was ceremoniously opened up after a baptism as an indication to the Devil and his minions that their departure was now desired. This was known as the Devil’s Door. This door is so low that only the top arch of the doorway is now visible, testimony to the change in ground levels since medieval times. The font was built to replace an earlier one that had been destroyed during the Commonwealth period when the non-conformist minister, Mr. Cornwall, showed his zeal by destroying the font and defacing the bosses. Only one boss survived and on the carving on the pillar by the font is a very well preserved piece of medieval sculpture. The figure is thought to be that of St. Thomas Becket and tradition states that the figure featured in this boss alone survived the Commonwealth since the people believed that Archbishop Becket had also been an enemy of the king. Cornwall is supposed to have been content with merely breaking off Becket’s Crosier (the hooked staff denoting his position as bishop). However, the archiepiscopal two-fingers form of benediction that has been left can still be seen, as Becket blesses those who pass by. The remains of other bosses to be seen in the church include the figures of Henry II, his Queen, Richard De Luci (whose tomb is in the Lady Chapel) and the Lord Chancellor. Some of the pillars in the South Aisle feature carvings of stylised oak, ivy and water lily. 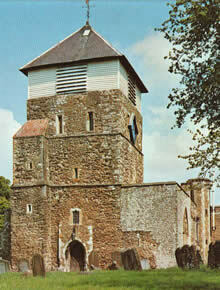 The oldest part of the building is said to be the Chancel Arch, reputedly dating from around 1200. The holes, where the rood screen would have rested before the Reformation, can still be seen. The rood Screen would have been destroyed by order of Act of Parliament. During another period of unrest, the Napoleonic Wars, a board bearing the Royal Arms and the message “Fear God, Honour the King” was placed over the Chancel Arch. This was done in order to rally the people of England and the board still survives today. There was a major fire in the church in 1554 when the Chancel and Chapel roofs were destroyed, leaving only the original medieval roofs in the Nave. When Archbishop Parker visited the parish in 1573, he reported that: “…the parishioners are so annoyed for lack of Rowme (room) that many therefore comme not to Church as they shulde.” At least, that was what they told him! Even the vicar had abandoned his flock: “…there vicar is absent and hath lette his benefice to a Curate.” The part of the church destroyed by fire was left in a state of disrepair for nearly fifty years until early in the seventeenth century when it was restored. It was at this time that the present Jacobean roofs in the Chancel and chapel were built. Hanging above the Nave of the church is the brass Candelabrum. This was installed in the mid 1700s and is candle lit on special occasions. The Candelabrum in the St. John the Baptist Chapel, which originally came from Yorkshire, is of the same date. Facing the altar can be seen the most striking, and the most modern, stained glass in the church: the East Window. Patrick Reyntiens, a craftsman whose work also features in the new Coventry Cathedral, created this window in 1962. The stained glass illustrates ‘Christ in Majesty’, based upon the Book of Revelation. Christ’s hand is raised in blessing, His mouth is speaking the Word of Life and on his knee rests the Book of Life. To Christ’s left stands the Archangel Michael, to whom the church is dedicated, seen here conquering the dragon. On the other side of Christ stands the Angel with the Trumpet from the Book of Revelation. The vivid colours are all symbolic: the colour blue is representative of Heaven whilst the colour green represents the World. The blood red circle symbolises eternity. One side of Christ’s face is shadowed, representing the sin of the World, whilst on the other side of His face the Glory of God is reflected. The lancet windows to either side are both abstract in design and they each include ten green eyes. Lancet windows were Early English Windows of the period 1200 to 1300 and the windows here are excellent examples of this style of architecture dating from this time. To the left of the altar is the North Aisle, added to the church in the early fourteenth century. The pillars here are much plainer than those in the South Aisle as they date from the fourteenth century. The stained glass in the north wall of the North Aisle was made by the famous William Morris workshop. The stone window in which the glass is housed is an excellent example of a cinquefoil (five-pointed) window. Norman builders were fascinated by geometrical designs. The Victorian stained glass window that can be seen in the west wall of the North Aisle is famous locally since it looks as if one of the figures is being offered a nice hot cup of tea! The North Aisle leads up to the St. John the Baptist Chapel. This part of the church dates from around 1400 and was originally built as a Chantry Chapel (a place for Masses to be offered daily for the souls of the dead) by Flemish weavers who had settled in Marden. It was during this period that Edward III encouraged Flemings to come to England and a flourishing cloth trade was established around the nearby towns of Cranbrook and Maidstone. The ‘fluted’ or ‘hollowed-out’ pillars found here provide evidence of the influence of these refugees. This type of pillar is unusual in an English church and is much more popular in churches on the Continent. The windows in this chapel belong to the Perpendicular period and are fine early examples of this style. They are considered to be among the best to come from the quarries of nearby Boughton Monchelsea; it is possible still to see the original mason’s mark. The furniture housed in this Chapel is hand made in English oak. The South Aisle and Lady Chapel were built shortly after the North Aisle. The Lady Chapel houses the remains of the thirteenth century tomb of Richard De Luci, the Lord Chief Justiciar at the time of Henry II. This was a position that brought him considerable wealth and power. He was a friend of Thomas Becket but he took the King’s side in the subsequent argument over the struggle for supremacy between Church and State. De Luci was filled with such remorse after the murder of Becket that he relinquished his Justiciarship and became a monk. He built the Abbey de Lesnes at Abbey Wood in North Kent where he later died and was buried. Many years later, vandals dug up his remains and exposed them so they were secretly brought to Marden to be re-interred. It is thought that when this twelfth century tomb was brought here from Abbey Wood, it was inserted in this chapel with the remains of De Luci buried half in and half out of the church, beneath the tombstone. The pinkish tinge that can be seen here is the result of the fire that burnt down the whole of the Chancel roof in the 16th century. The Lady Chapel houses a beautiful modern oak screen carved with a painted frieze incorporating hops, apples and cherries, representing the harvest of the parish. This was erected in 1953 when the Chapel was restored. The stained glass window in the Lady Chapel comes from the workshops of the Victorian company of Whitefriars. At the entrance to the Lady Chapel can be found the Book of Remembrance, mounted on a large brass lectern; this lectern was made at the end of the 19th century by the then Vicar’s daughter. There are two war memorials in the church, which can be found at the western end of the south aisle. They remember those villagers who lost their lives in the two World Wars and include the names of those civilians who were killed in Marden in the Second World War. In this area of the church, you can also see the long list of the vicars of Marden, which stretches back to 1292. The Vestry that lies behind the door in here was built in 1887, to mark the Golden Jubilee of Queen Victoria. There was at one time a gallery that stood over the Vestry Door, probably for musicians. There are now eight bells as in 1909 the original bells were recast and added to. Outside the west door, there are grooves in the woodwork. It is thought that these are the result of the sexton pulling a bell-rope as he waited to see the funeral procession arrive. The churchyard itself contains many very old gravestones; the oldest of these that can be read is that of Thomas Turner who died in 1663, the year after the present font was installed in the church.